A daring young lieutenant from Bolling Field, Clayton Bissell, let the moon and the stars be his guide on a series of night flights to Langley Field, Virginia, starting June 16, 1922. 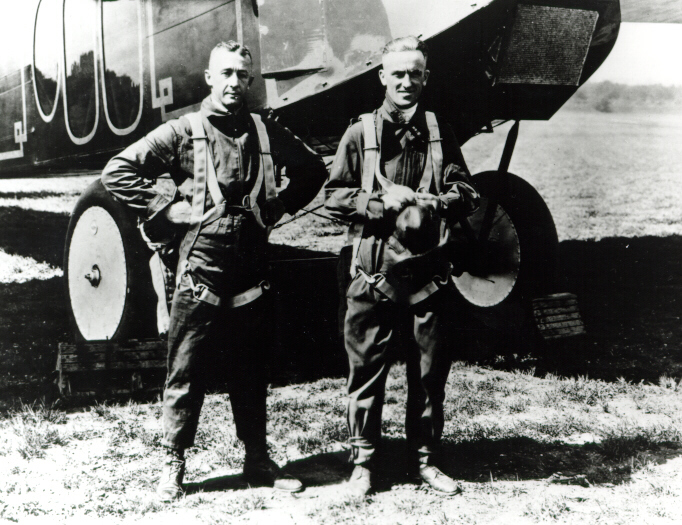 By August, Lieutenant Bissell had accomplished the first night flight ever made from Washington to New York City. According to the Air Service Newsletter, August 1922, "Judging from the experiences of Lieutenant Bissell, it would appear that flying at night, provided thereare no clouds to obscure the visibility, is just as safe as during the day and, furthermore, the moon and the stars are not only great aids to visibility but serve as an unfailing guide in the matter of aiding the pilot in his direction of flight, something which cannot always be said of the airplane compass." The article added that the lieutenant's flight deserved special merit because "We may gain from it the satisfying knowledge that no longer will it be possible, in the event of war, for enemy battleships to glide in near our shores during the dark of the moon and get away with it." He conceived the idea of the night flights from Bolling to Langley Field for training purposes and to prove that the flights were feasible over routes that were "properly organized and sufficiently known by the navigating personnel." He requested authority to make the first flight during the full moon, in order to take advantage of the maximum amount of light, his second flight during the last quarter of the moon, and his third and fourth flights by the dark of the moon. The route from Bolling to Langley was selected so that it would always be possible to land in the water in case of emergency. During one flight to Langley, Lieutenant Bissell noticed four U.S. battleships and three destroyers anchored just east of Yorktown, Virginia. "He states that it was very easy to see these ships due to the lights on them," stated the Air Service Newsletter, "but that even had there been no lights on them at all the ships could have been easily picked up by the flow of the fire coming out of their funnels. This ability of air pilots to pick up seacraft at night may have an important bearing on the utilization of the Air Service in future military operations."